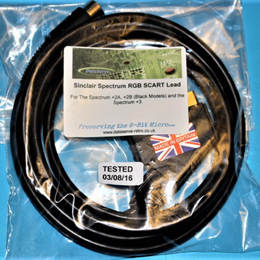 For the Sinclair Spectrum +2A & +2B (black models) and the Spectrum +3. Gives high quality RGB picture and sound. 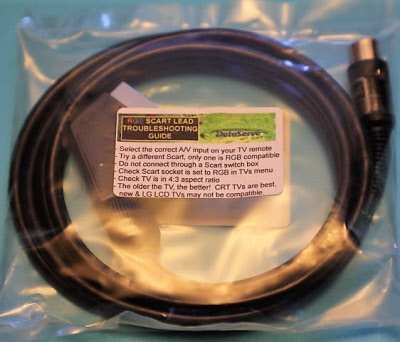 Your TV must be capable of manual switching to the AV channel the RGB scart cable is connected to - most are via the remote controller, but please check your manual, some new Plasma & LCD models may present a problem with very old computers, the older type CRT type TV's are the best. Click on the "More" tab for our troubleshooting guide. Can be returned for a refund if non-compatible. Please note this is not suitable for the Spectrum +2 (grey model) - see "Related Products" below for a link to that lead. The older the TV, the better! CRT TVs are best, new & LG LCD TVs may not be compatible.